When I found out that there was a DVD of The Narnia Code, I leapt at the chance to review it. I reviewed the book a couple of weeks ago, and I welcomed the chance to share what I had read more easily with my family. I wondered, though, if I would find value in the DVD for me. The Chronicles of Narnia series by C. S. Lewis has become one of the most globally beloved franchises in history. And yet, there are mysteries about the author and these seven stories that have fascinated scholars and fans for nearly half a century. 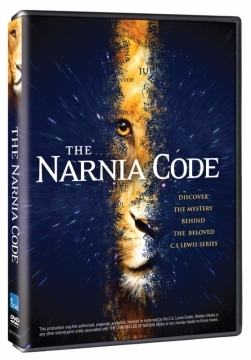 Enter Michael Ward who takes us inside the pages of Lewis' masterpieces and discovers a "secret imaginative key" - THE NARNIA CODE DVD. Like a detective embroiled in an exclusive chase, Ward takes us on an illuminating adventure into medieval cosmology and spiritual symbolism. His absorbing conclusions reveal a new third layer of hidden delight that will forever change your love and appreciation for C. S. Lewis and the Narnia books. The video starts off with about a 15 minute video biography of C. S. Lewis, which is interesting all by itself. I vaguely knew his story, but the dramatization certainly made it more real. The biography continues throughout, but once we get to Narnia, the focus shifts. The next quarter of an hour basically has to do with the Narnia series itself, and a bit about how Michael Ward discovered this medieval astronomy connection. The final half hour actually details the planet-book connections, and more information about his theory and other people's reactions to this. In the DVD, Ward only addresses the first four books - The Lion, the Witch and the Wardrobe, Prince Caspian, Voyage of the Dawn Treader, and The Silver Chair. He does a great job describing them. Then, there are the bonus features. Another 45 minutes of material. The first is interviews with people who knew Lewis well. The second shows "home" for Lewis. The third is primarily Michael Ward talking about the planetary symbolism for all seven books, repeating some information from the main feature about the first four books, but adding information about the other three. I would highly recommend the DVD to anyone with any interest in C. S. Lewis, and/or in Narnia, from tweens to grown-ups. My older two sons (12 and 13) both enjoyed this. As soon as Connor was grasping the concept, he started trying to work out for himself which planet went with which book, based primarily on mythology. One of Michael Ward's statements towards the end of the DVD was something like, "Isn't it obvious once you see it?" We are all in agreement here. And... I have the chance to give a copy to one of you! Leave a separate comment for each entry, please! Visit The Narnia Code and poke around. Then comment about something that you learned or something that intrigued you. Share information about The Narnia Code's website, or their trailer, on Facebook, your blog, or somewhere. Include the link in your entry comment, if applicable. Share about this giveaway, and again, include a link. Follow me through Google Friend Connect or Networked Blogs. Can enter one for each way. Tell me who in your family would be most interested in this DVD and why. I will draw a winner on December 13 after I get home from Scouts. In other words, no entries after 11 pm Mountain Time. I may get the winner posted that night, but more likely it will be Tuesday morning. I will use random.org to generate a winner. If I don't hear from you with shipping information, I will draw a new winner. I had no idea there was any "cosmology" behind the books and that it had anything to do with planets. Call me clueless! I have liked the Narnia Code Facebook page. I'm already your facebook friend! I would love it best!!! I love C. S. Lewis and I'm the one most likely to poke around the DVD though we are all lewis fans and I'm sure the others would be interested in it too! I shared about the DVD on Facebook. I think right now, I would the one most interested. My daughter is only 7 and we've only done the first three Narnia books (they got a little violent for her so we took a break). But when we start up again, I'd like to know more about all of this so I can better teach her! I already follow you on Google Friend! I think everyone in my family would be interested in this but I am listing myself as the person most interested. I have this fascination with C.S.Lewis and I've always wondered about some of the themes I've seen in the Narnia books that others seem to gloss over, ignore or just don't see. I'm pretty sure my husband will be the most interested, followed by me. After that, definitely my oldest. We all love Narnia though, so the whole family is likely to be interested at least a little. I'm also a Google Friend. I'm also your facebook friend already :). I found it intersting to learn about the seven heavens. I would like to know more about that! The most interested in our family would be myself and my nine year old. He and I love Narina and we discuss it frequently. I had no idea about the seven heaven, Jupiter, mars connection. My son Paperboy would love this. I would be very interested in this. I love the Narnia series, and I've always wondered about the symbolism Lewis used. I already follow you on Networked Blogs. Already friends with you on facebook. I linked this on my FB page.